Cereal Boxes are used to store and package Wheaties in a secure and professional manner. These boxes should be professionally designed and printed as these are used to showcase food items. As a wheaties production unit, make sure your packaging boxes represent your product in best possible way. 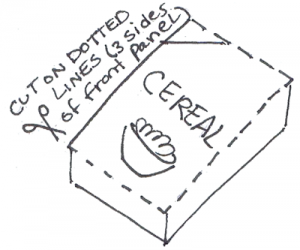 There are two ways to acquire packaging for your cereal item. Either you can make your own cereal box or you can hire a professional designer & printer who can do this for you, It depends on your budget. As a small startup business, you would obviously want to save every penny and would like to try it yourself. Below are 5 steps guide on how to make your own cereal box. First step is to decide what kind of packaging you need for your wheaties. The most used and low cost packaging is the boxes made out of cardboard. Check out the market and get few sample products of the top brands and analyze how they are doing it. Check out what kind of information they are putting on the boxes like Name of product, logo, images or cartoons, nutrition facts and other production information. Select one of the sample you like and start writing your information in order. Once you have the initial information you want to put on the boxes, now the 2nd step is to decide what size boxes you want to go with. Standard size of the cereal box is 12″ height x 7.625″ width x 2.5″ depth. But it depends on your product serving. Plus if you want to produce only 10 to 25 boxes then you will need to have these done using digital printer and digital printer can only print maximum size of 11″x17″. Up-till this stage, you have the information you want to put on the boxes and you have decided on the size and shape of the box you want to go with. Now you want to layout the design of this box so that it can be designed. The easy way to design your box artwork is to use Adobe Photoshop software, its very easy to use. If you don’t know how to use it then you can use MS Publisher or even MS Powerpoint to design your box. The first step for designing is the die-lines on which the design of the box will be laid out. There are many sites out their those offer Free templates like www.myboxprinter.com. 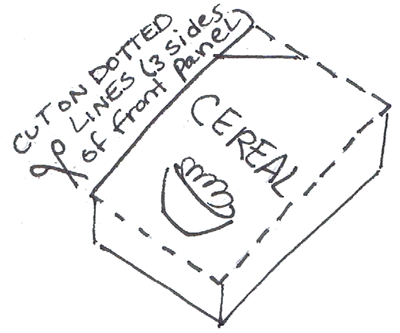 You can go online at site and request for free template for cereal box. They will email you the free template. Open the template in MS Publisher and start putting the things on the template. Like writing the information on the box you gathered in the Step 1 and lay the things out in a similar fashion as its laid out on the box sample you chose in Step 1. Your can easily select your favorite font and pictures from publisher and put on the box layout. Once you have the design layout ready, now you can take it to near by FedEx Kinkos shop or any other digital printing facility. Tell them to print this layout on the biggest sheet they have available. Initially you can have only 2 to 3 prints of these sheets. Make sure to have this layout printed horizontally on the white cardboard sheet. One important step, make the die-lines in the template light gray and not red as usually when someone sends template they make the template lines as red. Make them light gray so they are slightly visible on the sheet. You will need these lines in the cutting process. Once you have the printed sheet in front of you with gray die lines, grab a cutter and start cutting the cardboard from one end along the gray die lines on the card. Make sure you cut straight and cleanly. Don’t hurry into this process as any error in cutting process will make the box look bad. Cutout the cardboard from the cutting lines and make the folding marks or creases at the creasing lines. Once you cut the cardboard, now you can past the pasting flap with each other and your first very own boxes is ready. Put your product inside and display it. 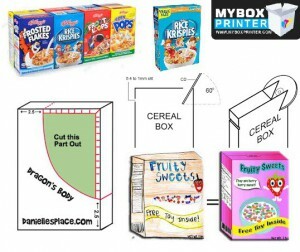 Now you have learned how to make your own cereal box and you can repeat the process to make as many boxes as you want. Remember one thing, this process, how to make your own cereal box, is only successful if you want to produce low quantities like 10 to 25 even up-to 50. But if you have requirement of more boxes then this process will be prove to be expensive one compared to other professional printing methods.